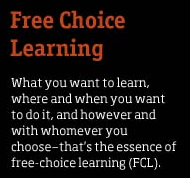 Explaining Free Choice Learning to the Relatives …..
Free Choice Learning – this is a term that I found myself using a lot the last few weeks while back east attending various family events. Many family members know and follow what I do with my research, career and schooling, however many do not and it seems like every few hours or days I was explaining my work to various people. Some met me with great enthusiasm, so with the oddest look followed by – really studying how and why people learn – they just do. Very interesting. As a personal study, I then followed up with the question that so many of us in the field us – well – What is your hobby? What are you an expert in? The initial resistance to answer and the always – Im not an expert in anything followed, but after a few minutes of conversation, fruitful discussion followed. For example a family friend has always taken photographs at all events, often following around and waiting for that candid shot. Over the years, the amazing photographs taken by this individual bring both pleasure and art to the family. This is not this person’s job; however, they can tell you almost anything about photography, even information about photography greats if you will. Even with this, this person would not accept that they were an expert in this area. In the end he agreed to think about it and have another conversation with me the net time we get together. Another example is my aunt. She is 83 years old and one of the most amazing land scape artists and gardeners I know. She can look at an area, walk around it, touch the soil between her fingers and design a beautiful relaxing garden. She knows what to plant in relation to the soil and sun and can bring almost anything back to life when most people would through the plant in the compost. She does all this without chemicals and any schooling. Her trade was business. As a child growing up, I loved working with her in her gardens. When talking to her, she will admit she knows a couple of things about gardening, but as she has not schooling, she can’t be an expert. I told her that my schooling says different, and yes you can be an expert. This area of free choice learning is one that interests me greatly, but still is not the norm for people to understand or see how the concept is used in their own lives. As programs and research in the filed continue to grow, maybe one day when I am at a family event and I say I work in the field of science education, free choice learning, I will not have to give an explanation …..
Posted in Free-Choice Learning, Research, Science Communication, Science Literacies. It’s so interesting how reluctant some people are to call themselves an expert. Why is that? I see some parallels in how some people consider themselves to be “doing science” and others (doing the same exact activity) do not.